It seems like line art is taking the stamping community by storm. I've frequently referenced myself as a "non-colorer" here on my blog. Can I color? Yes! Do I love the results? Often times, no. I attended a Copic certification class a couple of years ago, so I have the background knowledge of how to use Copics, blending techniques, shadowing etc. What I am finding though is that the process is not enjoyable for me. It just takes SO long to come up with something I don't want to throw in the trash. This has had me thinking. How can I get around coloring a line art stamp? I have come of tips/tricks up my sleeve. While I love what others do with different coloring mediums, it's not for me and I need to find ways to make awesome cards using line stamp without coloring. If you are a non-colorer too, you'll want to stop by every so often because I'll be adding quite a few posts over the next month as I explore different techniques that work for me! My first tip may not sound like a very good tip, but bare with me :) Tip #1: Don't do anything. What? Here's what I mean. A huge flower like this Mondo Poinsettia from Ellen Hutson would usually be giving me heart palpitations by now, but no worries, I'm not going to do any coloring whatsoever. Simply stamp or heat emboss your image on white or colored card stock and use it on your card. How's that for an easy way out? No one said that you have to be a coloring expert! I'm taking those words to heart. I do not enjoy coloring, I'm not going to force myself to become an expert. That is ok and I'm cool with that. Here are a few more cards I've made using my "Don't Do Anything" technique. I think these images are just adorable simply stamped. I'll be back in a few days with another tip. Stay tuned! Thanks and double thanks for posting about this topic Maureen! Though I don't do Copics and instead do watercoloring, I have the same problem - I end up not liking so many things I color!! Thanks for providing alternatives!! I'm so happy to see you are doing this. I am terrible at coloring--any technique. Thank you. 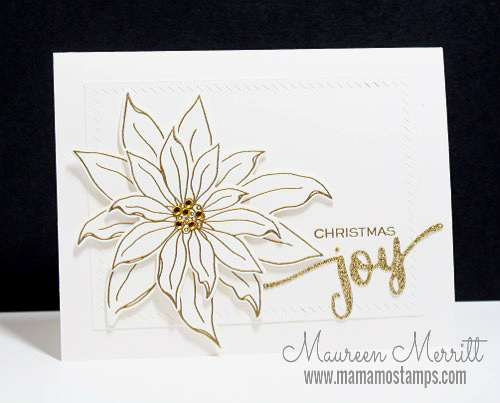 LOVE this gorgeous card, Mo! Great tip!!! Perfection, Mo! I have colored, but don't like to take the time to ruin my cards with an "accident", either. Thanks so very much for sharing! Mo this card is is stunning! I am with you about about the color is takes to long and I never am happy with it this is great tip thanks for sharing! Your cards are always beautiful. Thank you, thank you, thank you for providing tips for the non colorer. I am just not a good colorer. What a great topic, right up my alley. I bought Copics and sold them within a couple of months, all the fussy shading.....not for me. I don't mind watercolouring but love the idea of "do nothing". I will look forward to your next post. Thank you. I am finding I like to color, but I have to be in the mood i.e. have gobs of time for just ONE card. LOVE your beautiful card examples, all are amazing! Thank you so much Maureen for this brilliant post!! I don't own Copics (to expensive for my budget) and only have cheap coloured pencils to use. I've always shied away from critter stamps etc because I feel they really need to be brought to life with amazing shading and colouring. I have recently purchased my first 12 pack of Ziggies and I'm experimenting with those but they only do so much. Such great inspirational cards using the stamps on their own and I can't wait for your next posts with suggestions. I'm sure there are a lot of 'non-colourers' out there who will love this!! Maireen, I too do not enjoy using markers or water colours. Love the look but find the process too tedious. So glad you are discussing this topic! Your large embossed flower card is stunning. I will be sure to check up to see your non colouring projects. Way to take a stand! Such a simple concept, with stunning results. I look forward to this series. Thank you for sharing your tips, Mo! Just saw your latest post in Feedly, so I'm starting at Tip 1. So nice to know there's an accomplished designer who calls herself a non-colorer! There's hope for me! I've done this technique, but need to remember it more often--gorgeous card! What a wonderful tip! Even though I do enjoy coloring I am certainly not an expert. Believe me shadowing is a bear for me. But to keep it this simple is wonderful. Thanks so much for this mini class. Hi Mo ~ Love this topic!! Actually bought the Spectrum Noirs because they were SO much less expensive and I've had SOME success with them but am more successful at times with watercolors. MOST successful with crayons!!! LOL Love the "leave it alone/do nothing" technique. Thanks for giving us permission to "do nothing."